I’ve written previously of my adoration for ornamental grasses. A few of you folks in the mid-Atlantic might have heard my “Grasses for the Masses!” presentation complete with lots of arm-waving. As with most of my talks, there’s usually some sort of interpretive dance involved. Most of our warm-season ornamental grasses are in full gloriousness at the moment. Because it’s autumn! 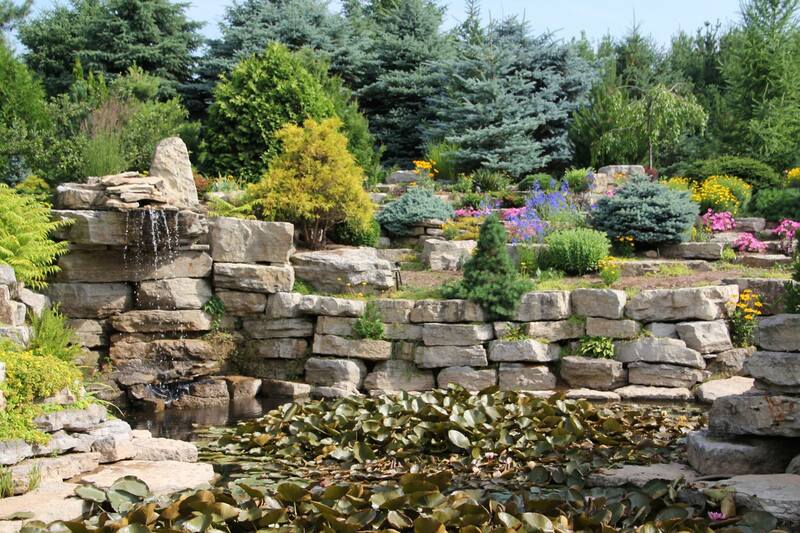 ‘Tis the season to purchase, plant, and enjoy ornamental grasses! 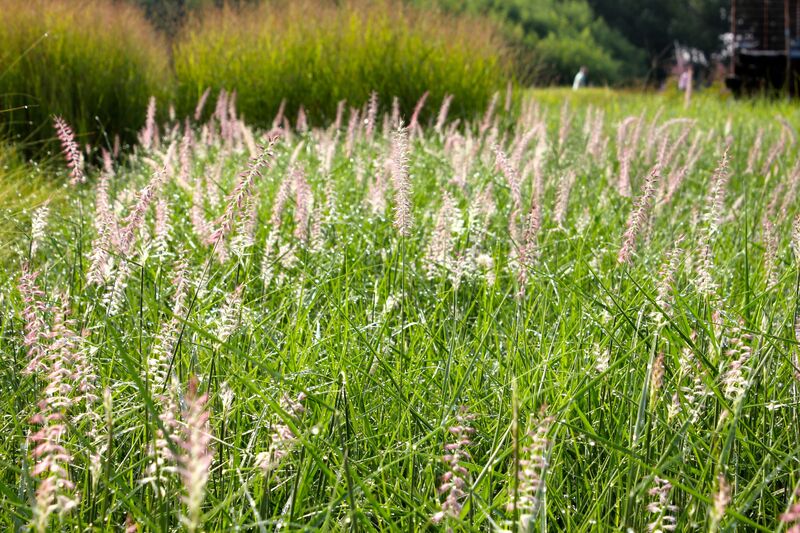 Pennisetum ‘Karley Rose’ – available at a garden center near you! Well, not really. If you’d have purchased and planted them in April or May, you’d only have to do the “enjoy” part now. And your local grower/garden center would LOVE you for it. But most gardeners overlook containers full of 6″ tall Fescue – which is what a LOT of our best grasses resemble in the spring. 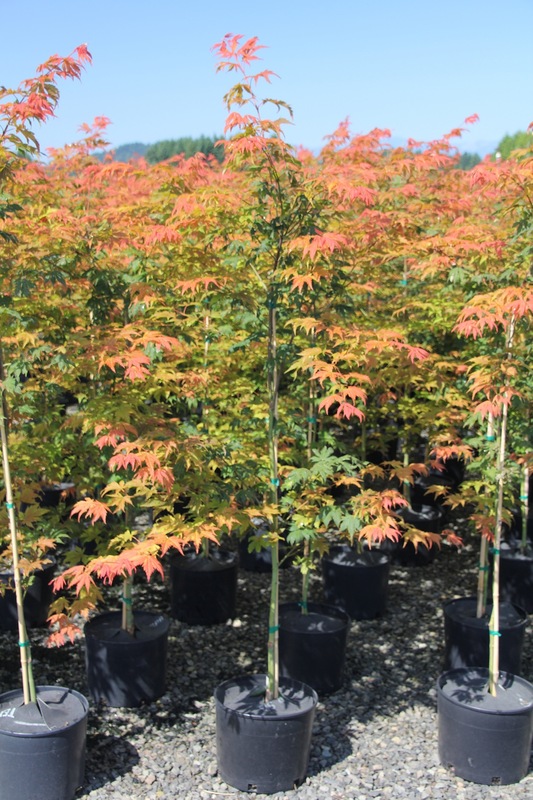 It’s always been challenging to sell “green” in the spring – consumers want to see and buy plants in flower – so nurseries and greenhouses that supply garden centers do their darnedest to provide said blossoms. Gorgeous grasses at Babikow Greenhouses near Baltimore, MD. So we pass over pots full of green grassy things in favor of enticing blooms. Nurseries have picked up on this – many include grasses in their summer/early fall production schedule, making full, fluffy pots for the autumn gardener. This works o.k. 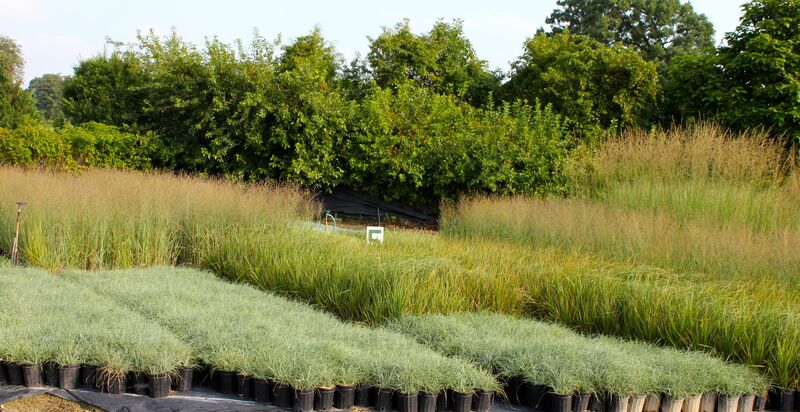 for shorter, compact things like fountain grass, little bluestem, etc. But by September, majestic switchgrass, big bluestem, and the like rarely look that fabulous in a one or two gallon pot – the proportions aren’t right; a bit of wind and rain and the situation is ripe for floppage (closely related to splayage). So you’ll probably pass them over. Again. Or maybe…take a second look? 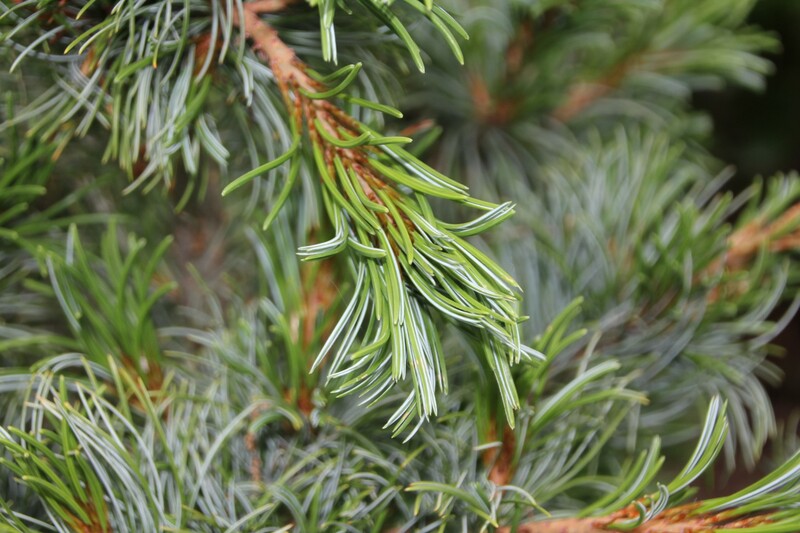 Just cut them back and plant away – you’ll enjoy them NEXT fall. Doubling of flowers — the development of extra petals — is a common mutation, and often beloved by gardeners. Sometimes double forms of flowers become so popular that gardeners hardly recognize the single flowered, wild-type. 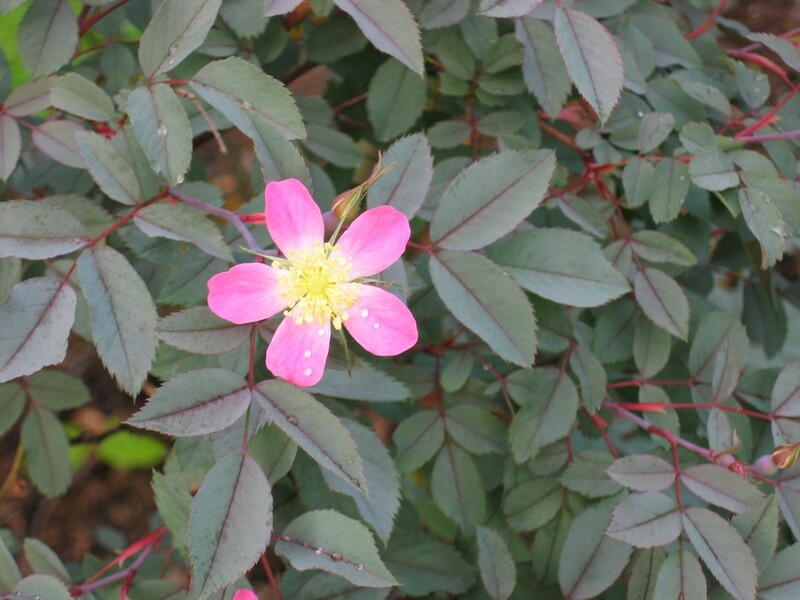 Wild roses, for example, have just 5 (or, in once case, 4) petals and look totally different than the extra petal flaunting varieties familiar from gardens. Here we have a flower of Iris xnorrisii (formerly known as x Pardancanda norrisii) with the usual six petals, and three “petaloids” — anthers that are stuck in an ugly transition between anther and petal. This is a seedling in my garden this year, and I’m going to grow out lots of seeds from it — hopefully some of them will get past the petaloid stage to full on extra petals and hey presto, a double flowered variety will be born! 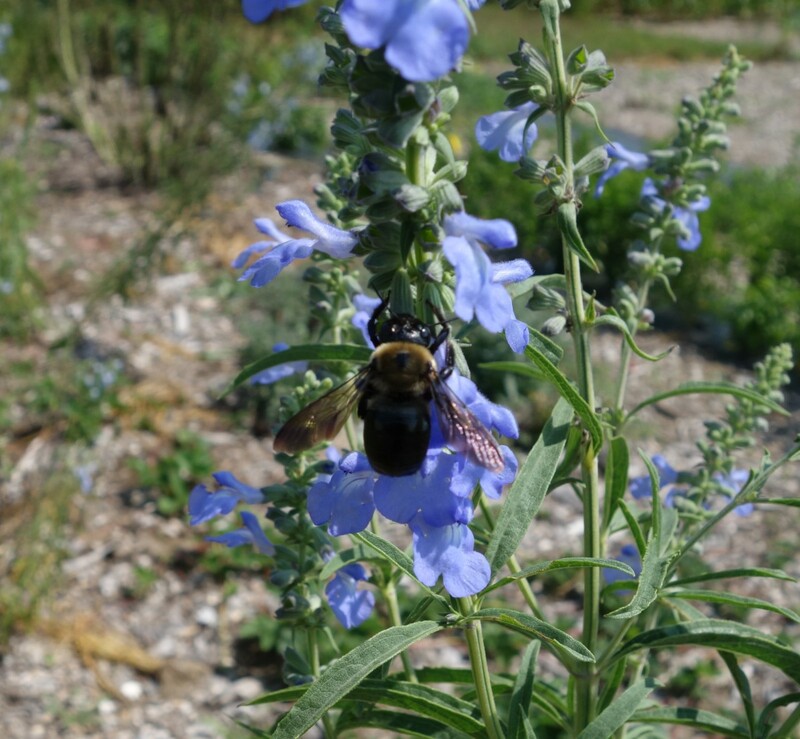 Salvia azurea (maybe my favorite salvia in the world — sky blue flowers in late summer/fall, hardy to zone 5) is blooming in the garden, and the bees are all over the flowers. But while some are poking their heads into the flowers to drink nectar and transferring pollen as they do so, others are up to something more sinister. This carpenter bee looks like it is pollinating. It isn’t. The evidence of what they are up to is clear if you look closely at the side of the flowers after they leave. The little hole at the base of the flower is clear sign of an illegal break in. See the little hole in the base of the flower? That is where the carpenter bee bit a hole in the flower to get access to the nectar instead of going in the front of the flower as one would expect. This phenomenon is called nectar robbing because it is an evolutionary betrayal of sorts. Flowers have evolved nectar to lure bees and other pollinators into the flower, so the bees will pollinate while getting their sugar fix. When the bees nectar rob, they’re getting the payment without doing the actual pollinating. So why bite a hole in the side of the flower instead of just going in the front? Well, many flowers have evolved flower forms that make the nectar hard to reach by anything but their preferred pollinator, the species that most effectively moves pollen from plant to plant. 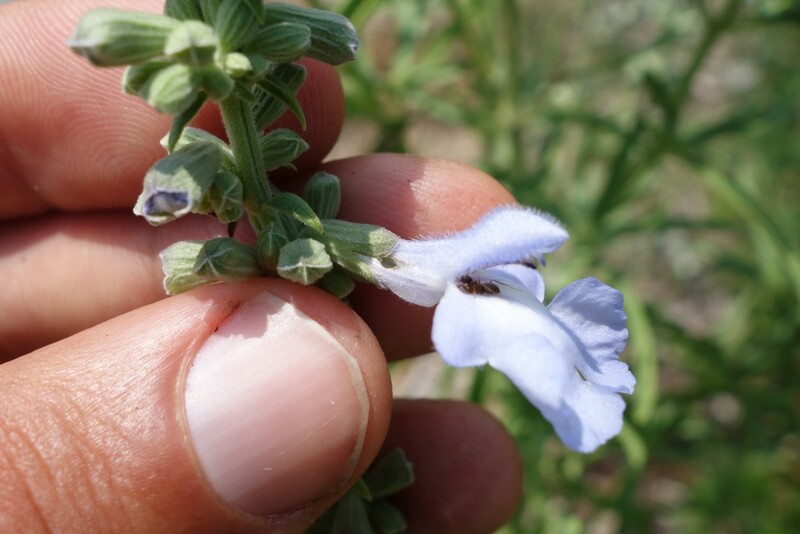 In the case of this salvia, the nectar is down at the base of the flower, and only accessible to bees with long tongues, like whatever species normally pollinates it in its native range in the US plains. In other words, it is out of reach of the carpenter bees to save it for another bee, probably a bumble bee. 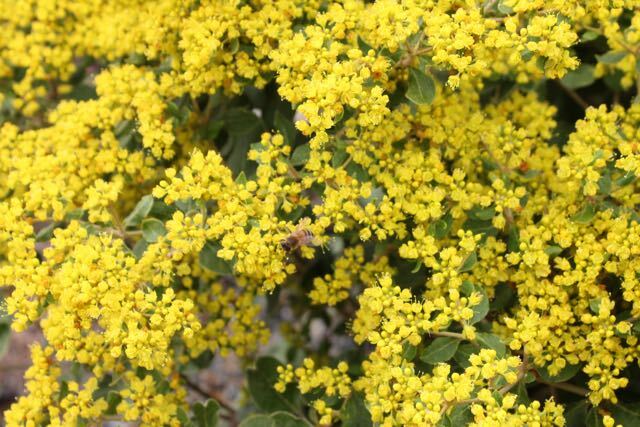 Which works great to avoid wasting nectar on sub-optimal pollinators… unless, of course, those bees become robbers. So next time you see bees on your flowers, take a look… they might just be robbers, not pollinators. Definitely was a crowd favorite during the Perennial Plant Association annual Symposium’s grower tour (mentioned in my previous post). These photos were taken at Emory Knoll Farms north of Baltimore; I believe that they were trialing and/or including it in their plant selection for green roof use. Thanks to Mary Vaananen, Jelitto’s North American operations manager (and goddess of perennial plant knowledge), who just happened to be standing next to it, full of 411, when I squealed “WHAT the (blankety blank) is THAT? 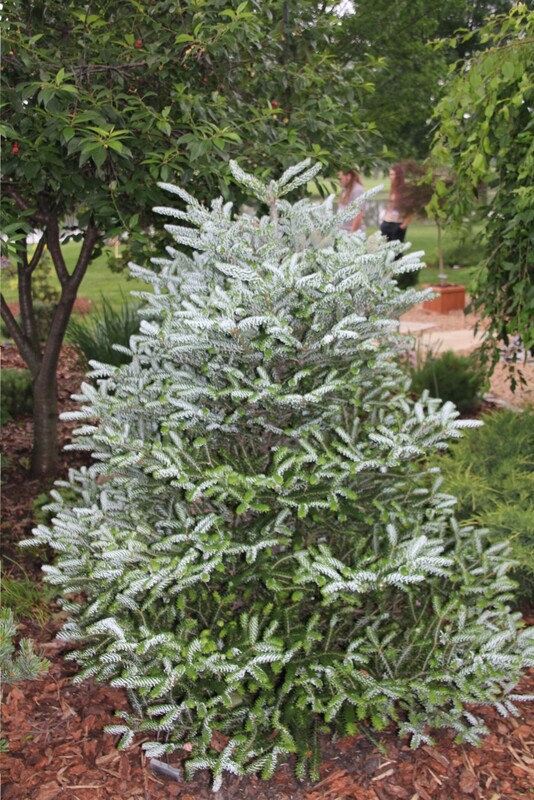 !” My compadre Paul Westervelt added more info, as he’s also a plant geek deluxe (and manager of the annuals and perennials section of Saunder Brothers Nursery). D’oh. Plus you rock gardening fanatics probably know this cutie as well (I may have first seen this in one of Joseph T.’s talks, now that I think about it). Eriogonum allenii, shale barren buckwheat, is native to counties that comprise the Virginia Highlands plus those on the West Virginia side of the line in the same region. Within these counties, the scattered populations reside in the botanical wonderlands called the shale barrens. This floriferous selection ‘Little Rascal’ is indeed from Jelitto, so you too can obtain seeds of this rarity (along with detailed germination/growing instructions). 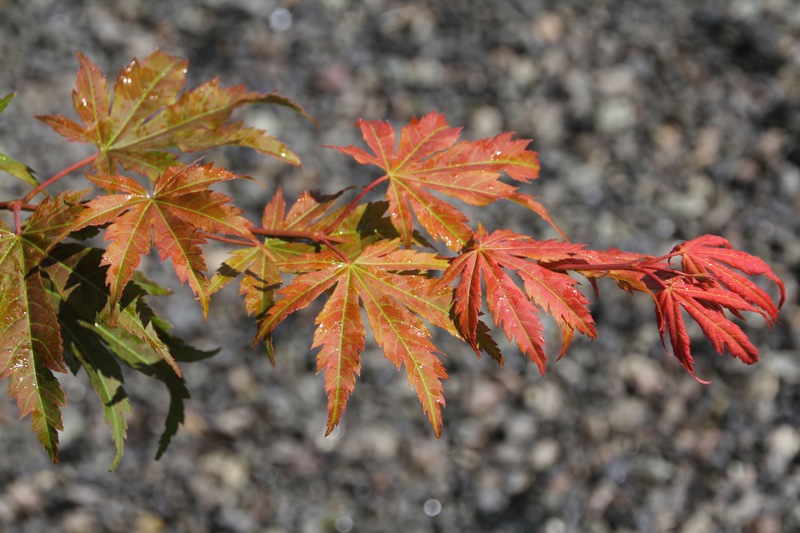 Jelitto lists hardiness to USDA zone 5. As with most species from the barrens, it requires plenty of sun and excellent drainage. 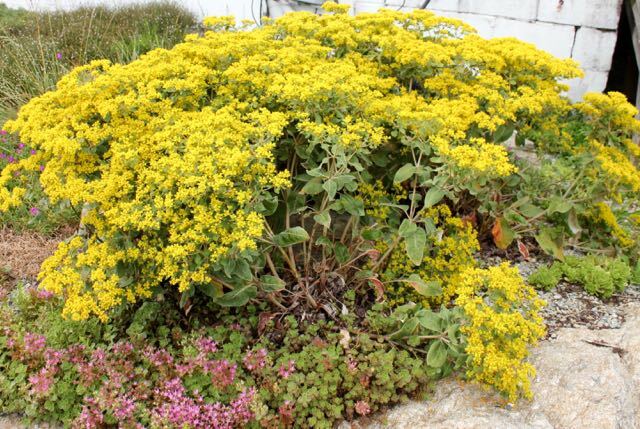 Stocky and slightly shrubby in habit, the coarse grey-green green foliage was, when I saw it at the end of July, completely smothered in deep gold flowers. Simply gorgeous. It was abuzz with bees of all sorts, including insanely happy honey bees that could barely attain lift-off. I have a plot of regular-old-buckwheat (same family, Polygonaceae), but our spoiled-rotten bees always seem underwhelmed. Wait till they get a load of this! Just back from the always-inspirational Perennial Plant Association Symposium, this year held in Baltimore. The theme celebrated the massive influence of German plantsmen and designers on both the mid-Atlantic and the perennial business as a whole. 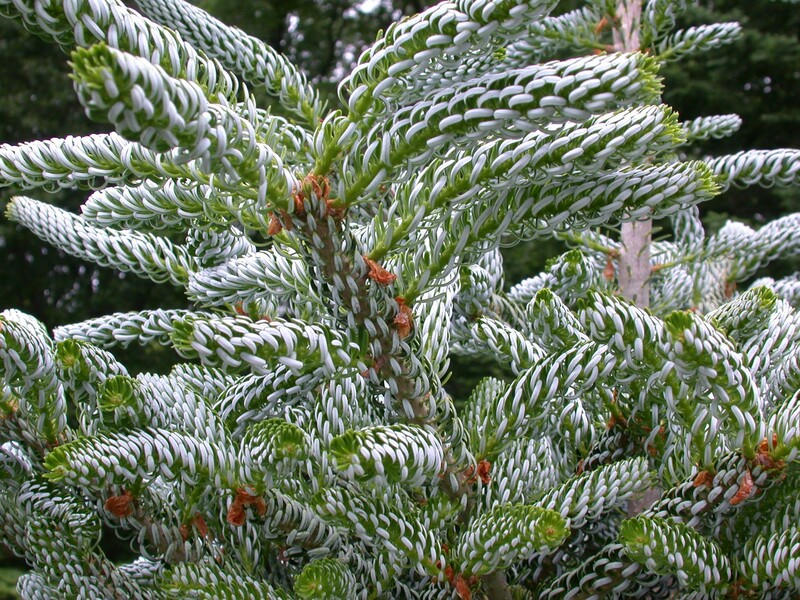 Whether a grower, garden center owner, or landscape designer, the names historically associated with Mid-Atlantic horticulture – Kurt Bluemel, Oehme, van Sweden & Associates, etc. – resonated with all attendees. 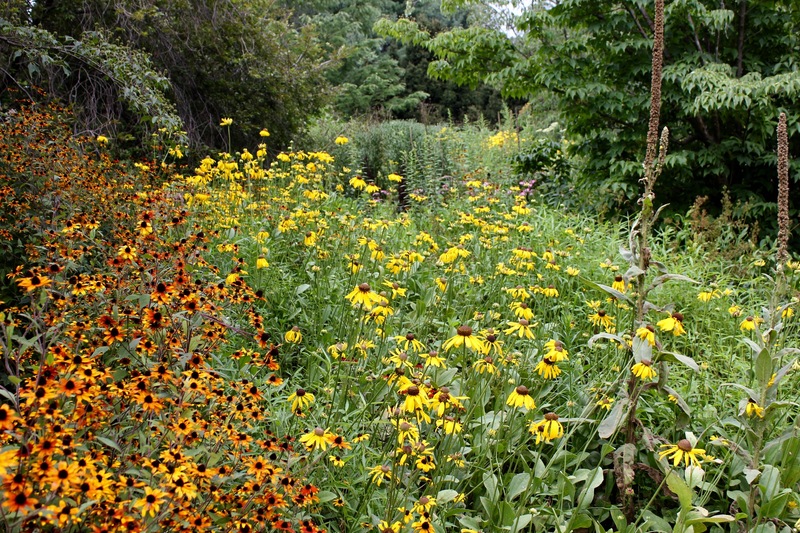 The history of the “perennials movement” was recounted – where the Germans (and more than a few Dutch) admired, utilized, and selected cultivars of our fabulous summer and fall-blooming native perennials – long before we North Americans ceased relegating them to ditch weeds. 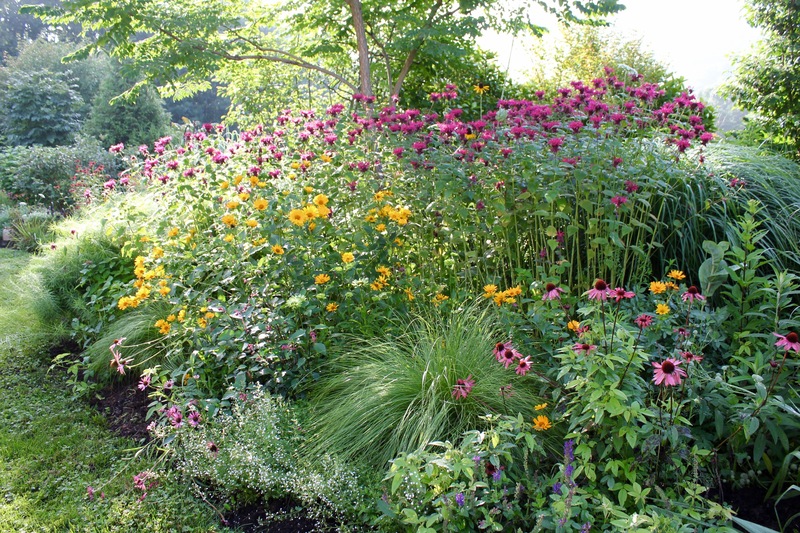 And then they taught us how to use them in “New American Garden” style – sweeping herbaceous plantings (fewer species but larger quantities of each), mixed with ornamental grasses and non-native but pollinator-friendly beauties such as Salvia nemorosa and Perovskia atriplicifolia. 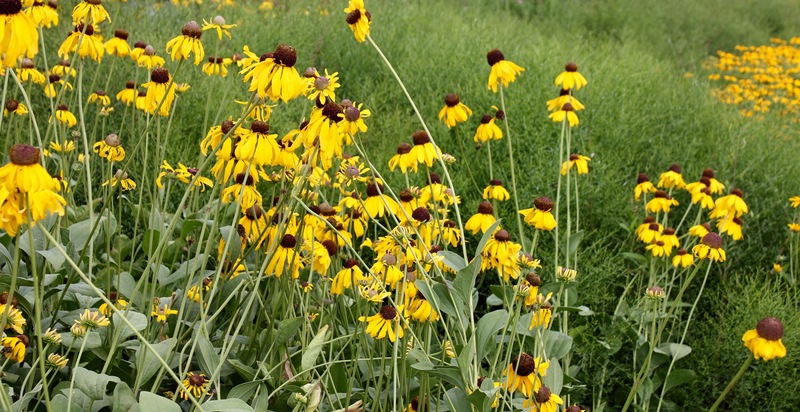 Rudbeckia grandiflora ‘Sundance’ massed with Rudbeckia triloba ‘Prairie Glow’ in the Bluemel garden. But this was my first encounter with Rudbeckia grandiflora ‘Sundance’. This seed strain was introduced by Jelitto® Staudensamen seven or eight years ago. It has a pretty broad native range… Midwest to South-Central United States. USDA cold hardiness zone ratings listed as 5-8 and 4-9 from various sources. Always full sun. Didn’t see a speck of powdery mildew. 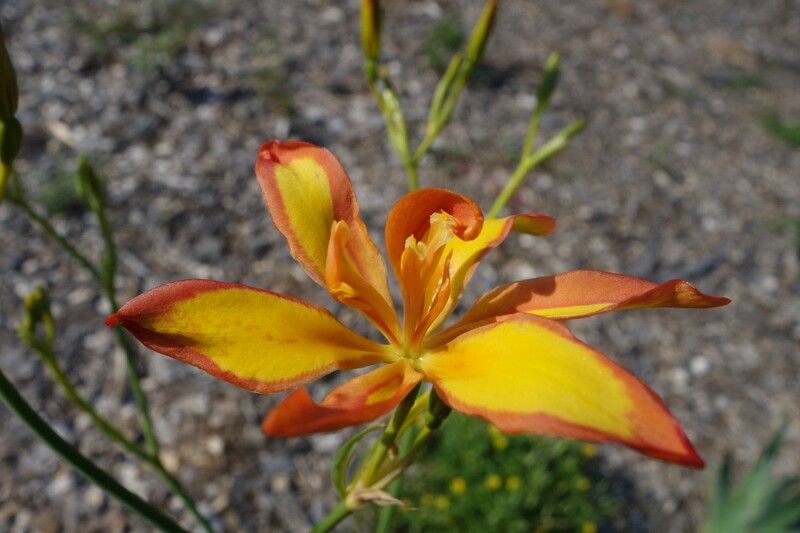 The flower habit is a bit like Ratibida pinnata – the slightly drooping petals give the sensation of movement (even with zero breeze, 90% humidity, and 96° F). The clear yellow color works with just about anything. Around 4’ tall, the sturdy stems showed little sign of flopping. I’m sure the cones will persist, adding texture as the fall progresses. ‘Sundance’ in action at Emory Knoll Farms. 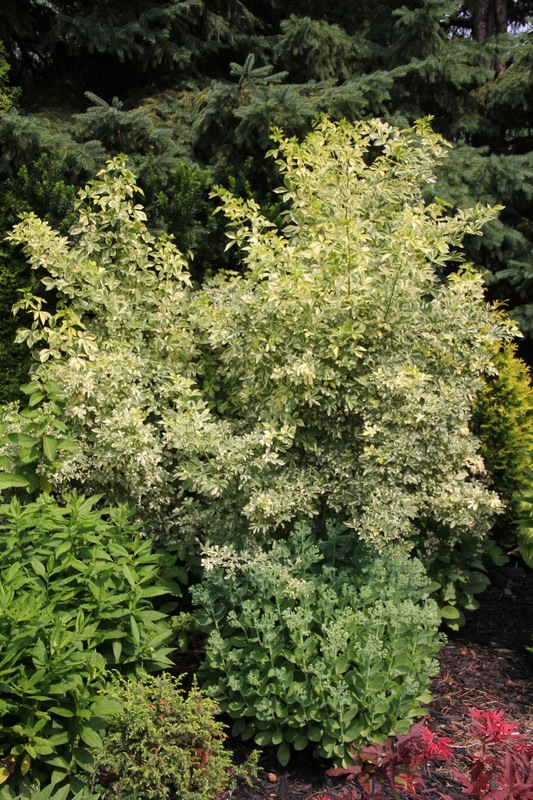 Crazy plant of the day is this: Pereskiopsis spathulata! 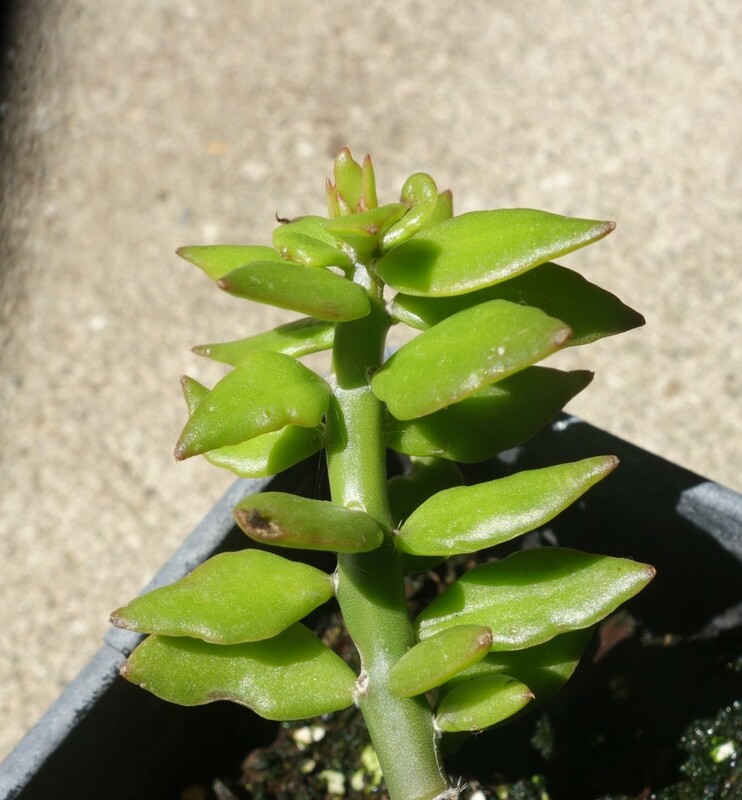 Which, I’ll admit, looks like a fairly generic succulent, but the cool thing is this is actually a cactus. A cactus with leaves. Most cactus have of course lost their leaves to increase their ability to survive in extremely dry conditions and rely on their stem for photosynthesis, but the genus Pereskiopsis is a bit of living evolutionary history with photosynthetic leaves still intact. It’s been a great summer for perennials here in the mountains of SW Virginia – plenty of rain, warm days, cooler nights. 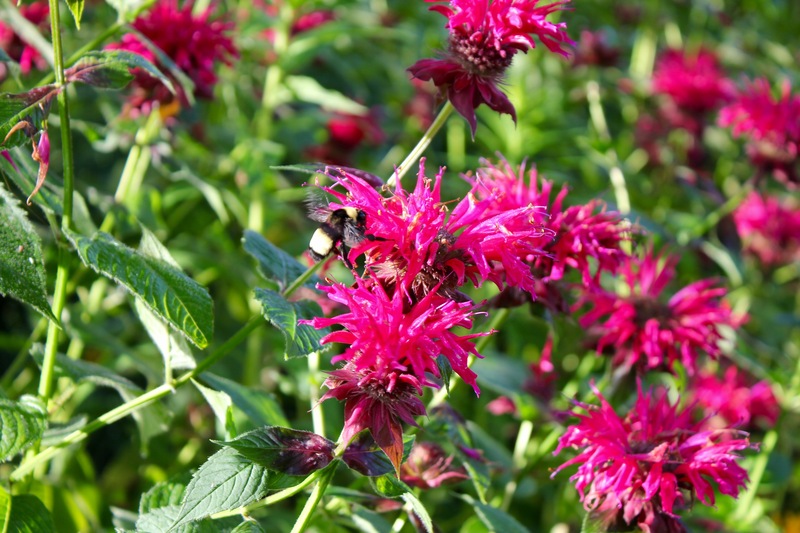 We’ve been enjoying this wonderful bee balm in our home garden for the last few weeks. ‘Raspberry Wine’ is tall (up to 5′), vigorous, and a bit ramble-y; not for the carefully-curated border, but great where it can take up some space. For those who fear Monarda’s tendency to spread, know that is shallow-rooted and very, very easy to pull up. I don’t know much about the origins of ‘Raspberry Wine’ other than it’s a Monarda didyma selection or hybrid and a “White Flower Farm introduction” – Joseph may be able to shed some light. Monarda didyma is plenty hardy (at least USDA Zone 4) and is included on just about everyone’s plant list for either pollinator gardens or “gardening for wildlife.” The species is bright scarlet, but ‘Raspberry Wine’ has rich magenta bloom with dusky purple bracts subtending the flowers. Speaking of wildlife, it doesn’t seem to be the first choice of deer, so I’d rate it as reasonably deer-resistant. There are a couple of very-territorial hummingbirds making their home next to it – can walk by any time of the day and they’re slurping away. Interestingly, they seem to be ignoring the red ‘Jacob Cline’ down the way. My photography skills aren’t such that I can snag a feeding hummer, but did catch a less-frantic bumble bee making the rounds (above). Bee balm out the yin-yang! 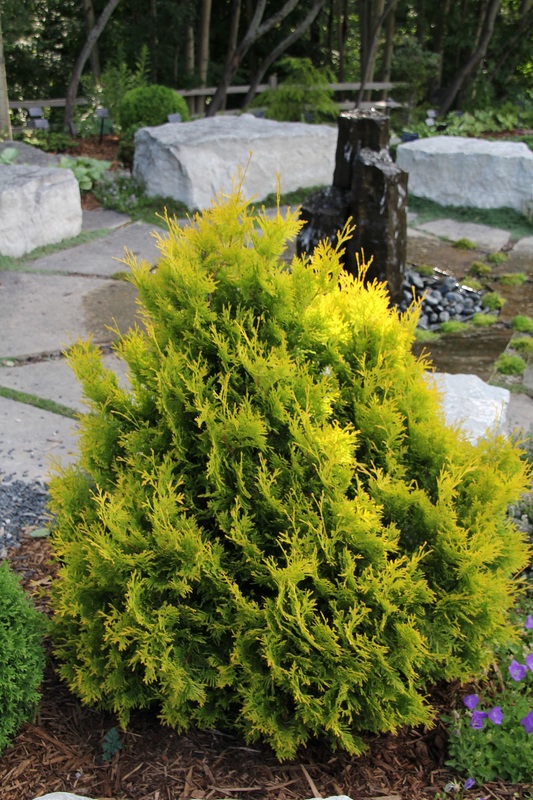 The clump pictured is part shade (afternoon) and the foliage is still fairly clean. I have another batch in full sun that has a bit of powdery mildew. 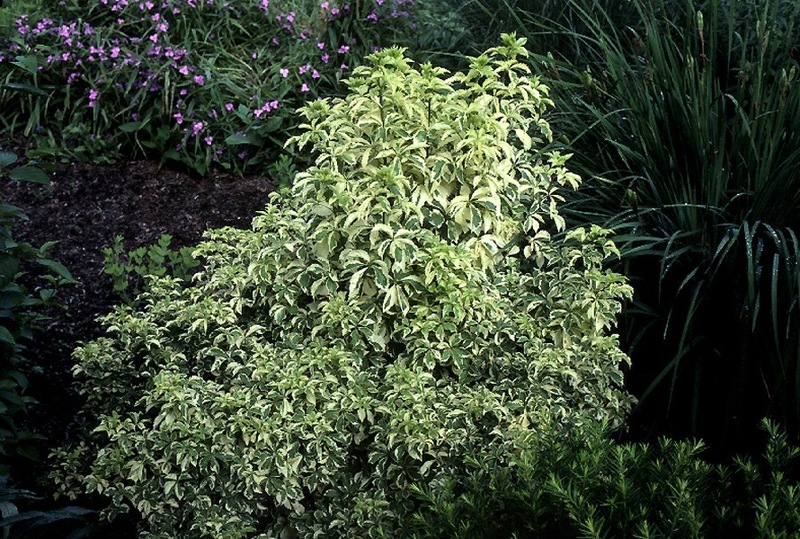 The red ‘Jacob Cline’ is frequently touted as powdery mildew resistant but I’ve yet to see ANY Monarda didyma species or hybrid that doesn’t end up with it eventually. 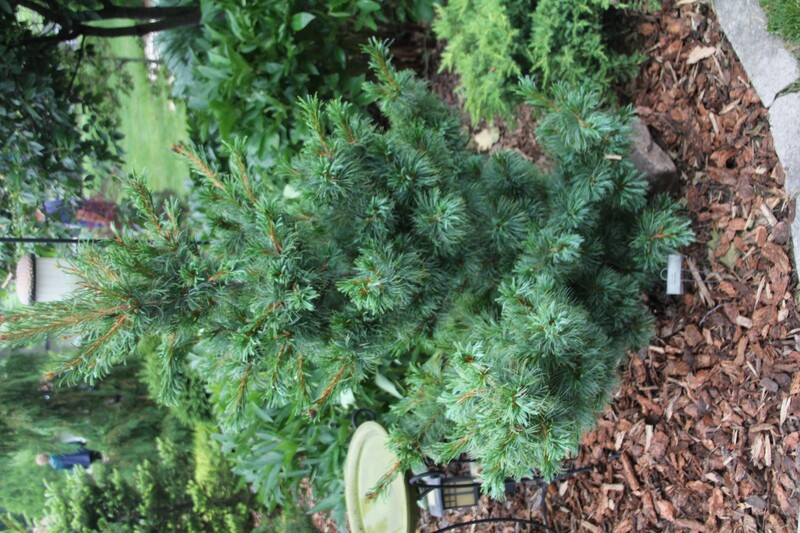 Just chop it back to the ground ASAP; you’ll get fresh new foliage and sometimes another round of blooms. Here’s a couple of clematis (clemati?) you may not be familiar with. Both are easy to grow but differ from the more common large-flowered form. 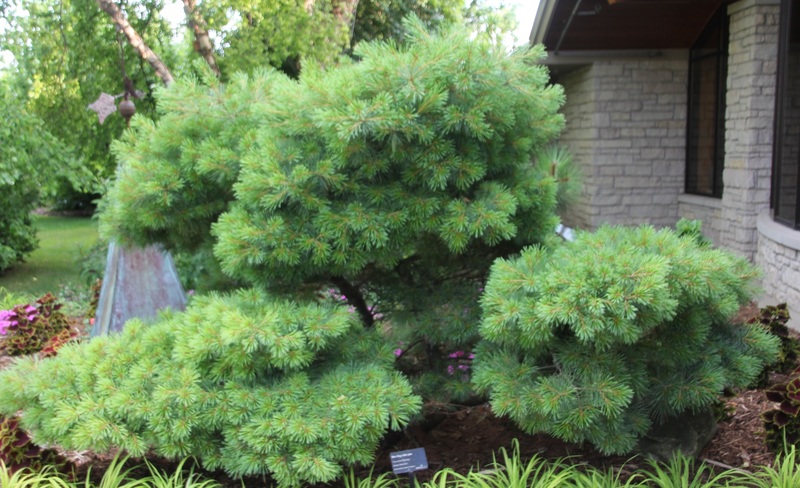 There is a great deal of hybridization within the genus, so many cultivars are placed within “groups” rather than described as a cultivar of the species. Clematis ‘Princess Diana’ in the author’s garden. Crossing a large-flower clematis cultivar with Clematis texensis (scarlet leather flower) resulted in this lily-shaped beauty. Pointy little buds open as four hot pink tepals; bright yellow stamens grace the center. The buds on this rebloomer just keep coming; mine has been blooming for 40 days at this point and doesn’t seem to be slowing down. The princess seems pretty happy in her part-shade (sun in the afternoon) situation in my garden. Some catalogs/sites describe ‘Princess Diana” as reaching only 8’ in length; mine’s wrapped up and down a 6’ tall tuteur/trellis thingy at least 4 times. Guess I need a bigger tuteur (doesn’t everybody?). Cold hardiness seems to be up for discussion – some sources state USDA Zones 6 to 9, others 4 to 8 (I’m a solid 6a here in the mountains of SW Virginia, recently warmed-up from 5b). Various pruning strategies are associated with different groups of clematis. This one dies back to the ground and blooms on new wood, so I just cut it back in early spring to clean last year’s vines out of the wire supports. Clematis ‘Blue Boy’ scrambles through a deciduous azalea. The rosy stems contrast nicely with the ornate foliage of Ligularia japonica. Despite its delicate appearance, this is a very tough and cold-hardy (Zone 3!) clematis. Enjoy all summer, and then chop ‘Blue Boy’ back with the rest of your die-back perennials in winter.